Of the big five European leagues last year, Juventus won their league by the largest margin. By creating a 17 point gap over Roma in raw point terms they were more convincing than Bayern (ten point gap), PSG (eight points), Chelsea (eight points) and Barcelona (two points). Onto this season and around the top European leagues you might expect a coin flip in Spain and at least that in England, but the other three leagues seemed far more likely to return the incumbents to their throne. Yet, during pre-season we had disparity in bookmakers’ prices. Both Bayern and PSG started their seasons at prohibitively short odds of around 1.10 (1/10) where Juventus were significantly longer at 1.66 (4/6). Why would this be so? Juventus had won the four previous titles, and had a ridiculously solid defence that hadn’t conceded any significant volume of goals throughout (20, 24, 23, 24). Their attack had also scored more than adequately each year (68, 71, 80, 72). Fresh from a Champions League final, surely they looked set to continue their dominance? This was a team that had dominated its league, so why were we looking at a set of odds that could tempt? Methods here can vary but by calculating this rather than using the actual point totals we find a more reliable method of understanding the true quality of a team. Here we have some insight into the difference between what might have seemed to be generous odds from the bookmakers and a more casual perception that a team that had just won it’s league by 17 points should be a prohibitively short price. The 2014-15 Juventus team was the best team in it’s league, it just wasn’t worth +17 points against its rivals or in front of the second or third rated teams by a very large margin in comparison to previous years. Still, understandably they remained favourites for the title throughout pre-season and there was a clear onus on other teams to improve to stand a chance of dethroning them; Roma have had good sides in previous years, as have Napoli and teams such as Lazio, Inter or Fiorentina could have some hope to build. What they may not have expected was the weird chaos to envelop early results of the bianconeri and as we reside here in mid-November, Bayern and PSG are coasting along leaving a trail of debris in their wake and Juventus are er… 7th. On the surface there may seem to be similarities with another malaise stricken European giant but where Chelsea’s performances have broadly pegged them at a position similar to where they reside, Juventus can consider themselves to have been somewhat unfortunate to have found themselves on the lower fringe of contention. So what’s happened to them? This is a team that had only lost ten matches in four seasons and has now been defeated four times in just twelve games. If the 2014-15 side was the weakest of their championship winning teams, then how strong is the 2015-16 iteration? Now these metrics are known to regress over time and do not intrinsically represent the true quality of the team. We can see here that it is extremely rare for Juventus to perform at below league average levels for both metrics at the same time, as is the case in the early weeks of this season. Indeed the last time it occurred was in the early stages of 2013-14 and it was followed by the most extreme skew in the chart for both metrics. That year they won 33 games, got 102 points and managed a 12 then later a seven game win streak. It’s worth remembering that these less consistent metrics can run extremely hot, as described here and extremely cold, as we are now seeing. Also throughout the Championship seasons those strong defensive numbers were assisted by a series of high save percentages: 2011-12: 81%, 2012-13: 78%, 2013-14: 81% and 2014-15: 76%. Through twelve games in 2015-16, Juventus’ have conceded almost half as many goals as they had in each of the last four seasons and their save percentage is significantly lower at 67%. They have been heavy shooters this year- but primarily at home. In six games at home, they have an incredibly high +100 shot differential over their opponents. That they have failed to convert this absolute dominance into more points seems somewhat of a quirk- conceding five times to only twelve shots on target here hasn’t helped and only 6.5% of all their shots have gone in- a low total. Away from home they have faced their three most difficult fixtures, at Napoli, Roma and Inter, and have gained only one point from what transpired to be closely matched games. With these games combined with their other fixtures, away from the Stadium they have been only a par shots team. In each of these games they have dominated yet conceded and failed to win. To have scored twice from 97 shots here is a phenomenal underperformance. Beyond this, they have only managed clean sheets in three of their opening twelve matches (compared to 9/12 last season). @ Empoli: hurried sliced clearance falls to attacker who advances unchallenged to edge of box then finds corner. By my reckoning, that’s three free kicks- including the rebounded effort- and eight goals that can be simply criticised from a defensive standpoint. Arguably, to concede free kicks in possible scoring positions is a similar failing. So, where Juventus have conceded a small volume of shots, those that have been conceded and caused greatest problems have implied issues within the structure of the team. It doesn’t take advanced analysis to work out that losing the three players highlighted might have an impact on a team. None of the three need any introduction but suffice to say that Pirlo and Vidal joined Juventus during the same summer in advance of the title runs and were huge contributors to each of the four Scudetto seasons. Not only in their general play and numerical contribution but in the key central part of the team as tempo setters and influencers. Even as Pirlo’s in-game influence may have declined, it is reasonable to assume as a highly decorated and respected professional, he would have been a presence around the club and involved with wider team issues. Organisations can often take time to readjust after big contributors have moved on, football is no different. Tevez, ever infusive and a genuinely elite striker had two seasons in which he averaged a shot contribution of over six per game, a goal contribution of around 0.9 per game and a goal scoring record of around 0.6 per game. These are numbers that are difficult to replace. The defense is aging- but the players that have inhabited the zone in front of the centre back have been various and likely inferior to the peak 2014-15 team. Bar one start against Chievo, Marchisio has only featured more recently as form and results have improved, as has Khedira. Early disappointments seem to feature Pogba + Sturaro or Lemina or Hernanes. This looks to have been a team in transition, with personnel issues. Lots of squad men, hard to choose starters. Nobody has managed to get on a run of scoring either, Dybala has three non-penalty goals, Mandzukic has two, others no more than one and it follows that conversion rates are generally poor. Again the question is: who is preferred? Alongside this it appears a variety of formations have been tried. Allegri hasn’t been afraid to experiment, but in chopping and changing personnel and formation, he has allowed vulnerabilities to creep into the team’s play. We can see some of the changes in subtle differences in the shot structure of the team. Juventus’ in-box shots are finding the target at a rate of only 40% (down from 58% last year and well under league average of 46%). The rate in which the opposition is finding the target- 32%- is around league average, however the percentage is the same both inside and outside the box meaning a huge rate of long range shots are finding the target. And they have been going in. One of the starkest contrasts I found was that Juventus scored 22 times from outside the box last season and conceded only four (three for and one against were direct free kicks). This year they have already conceded six times from range while scoring only three (0:2 for direct free kicks). 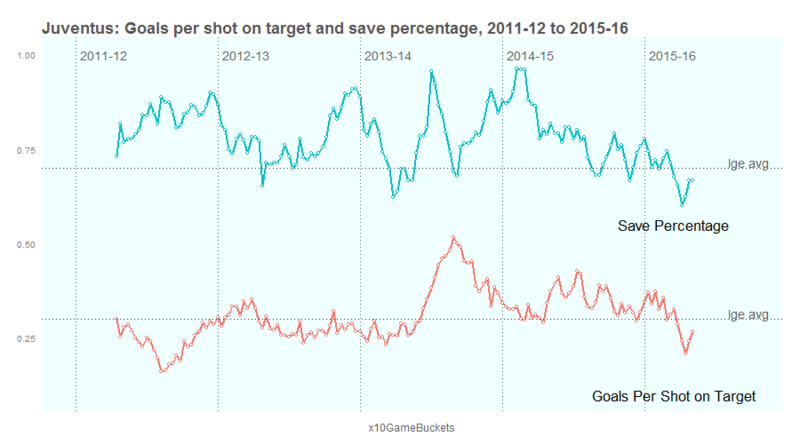 Only Milan have conceded as many and only they have a worse save rate for such shots. This is where I find an analytical quandary, because typically you might expect that this high rate would cool off and a more balanced profile would emerge, but having analysed the goals conceded, I feel that there is a likelihood that the rotation of personnel has had an impact on turning what was a solid defensive unit into what we see now- a good team but one with vulnerabilities. This is where there is a need to find a balance. Some factors can be solidly attributed to a numerical dissection, whereas others require more nuance. Here we see the benefit of looking at a variety of influences to form an analysis, multiple factors are involved in the success or failure of a team’s methods and it’s simply not sufficient to conclude that “Juventus are the best team in the league, but have been unlucky or affected by random variation”. It is most likely that Juve will find a stability in team selection as time goes on and it will help their results, indeed they are 3-1-0, and have looked generally more solid with Khedira, Marchisio and Pogba starting together as a unit and this is all within the last five games. Their two hardest fixtures- at Roma and Napoli- are behind them and they were competitive in each. They are unlikely to fail to win many more matches in which they take 25+ shots and it is unwise to be negative about a squad that has such wide talent within the league. Also unlikely to continue, at least at the rate it has been up until now, is the rate in which they have fallen behind. Having taken the lead in only four of twelve fixtures and fallen behind in seven- and five times within half an hour- they have been faced with frequent deficits to overcome. 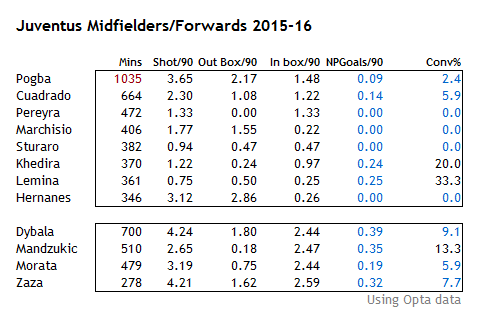 To some degree this has powered what appear to be extremely strong shooting numbers, a bias that cannot be ignored. The Scudetto might be beyond them this time, and the slight caution from the bookmakers may well have been shrewd. This Juventus team remains a good one, but it probably isn’t as great as those that went before. 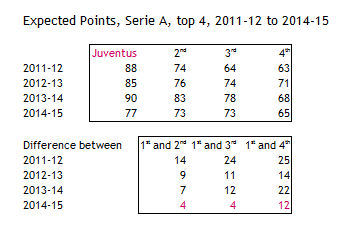 The Serie A title race looks to be one of the more open that we have seen in recent years and all the better for that.